Our Inspiration : For centuries , France has been the center of art , fashion , beauty and wine . Each region is rich in culture and history that inspires a certain joie de vivre . Curiosity leads us to discovery , which opens the door to inspiration . At OLAVIE our vision is a reflection of beauty and style .From the vineyard dotted countryside of Burgundy to the sophistication and allure of Parisian woman , we are inspired by timeless beauty in all of its many expressions. Where we come from : OLAVIE is skin care products are unique because we use Chardonnay grape seed extract harvested in Burgundy , France . Four hours southeast of Paris , this region is recognized worldwide for its wine. Our mission is to bring you a vineyard of relaxation and antioxidant benefits. Throughout the ages, wine has been the fountain of health and longevity. However, it wasn't until the last century that wine was proven scientifically to be beneficial to the cardiovascular system. 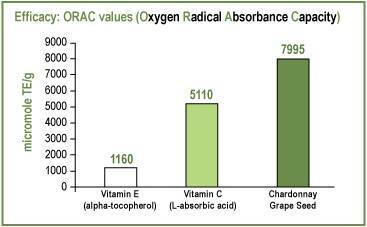 The Chardonnay grape seed extract in all the Chardonnay Wine Therapy products are 7 times more powerful than Vitamin E (see chart to the left). To bring you the finest skin care products possible, we sourced from Burgundy, France an extract from the seeds of Chardonnay grapes. The extraction is done immediately after harvest but before fermentation, this saves the highest amount of antioxidant.